This post concludes our series on God’s response to suffering, including sacrifice, care for the poor and needy, and almsgiving. I must be honest with you. One of my biggest fears about becoming a Catholic was the whole concept of fasting. As a Protestant, fasting was not something that we did. It was just some exterior work that was put aside long ago in the antiquated Church. I never believed that I would ever have to take part in such an archaic tradition. But when I became a Catholic, suddenly I had to come to grips with the idea of fasting. I have learned that there is nothing superficial or arbitrary in the teachings of the Church, and fasting is no exception. I had to move beyond thinking about fasting as just a means by which the Church could control us or even as something that I did for God. There had to be a true meaning and benefit behind it other than (wrongly) viewing it as a modern day means of torture from the Church or something that God somehow needed from me. 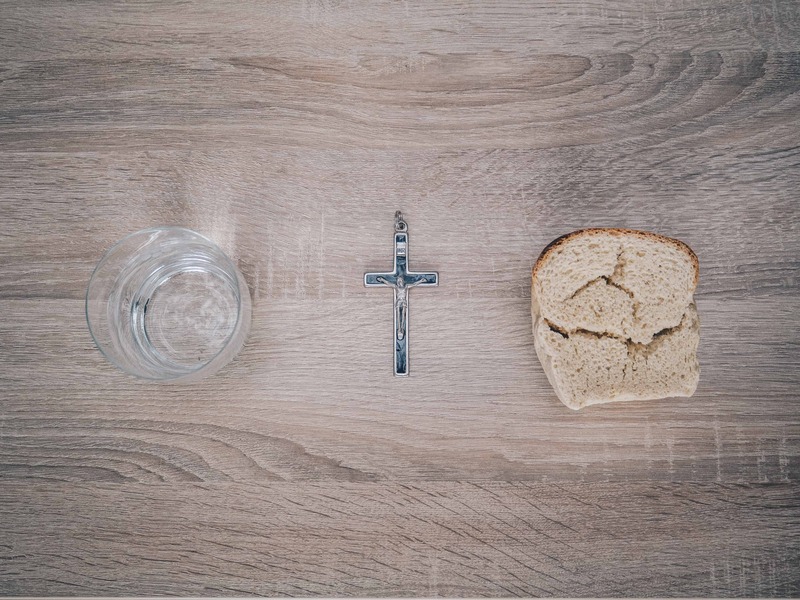 Over time I came to understand that fasting is not just something to make us feel holy, it is not just something required from time to time by the Church, but it is an essential part of our growth in our relationship with God. God asks us to fast not for his benefit, but for ours. There are many references in Scripture to fasting. Most of these references are in relation to repenting from one sins (e.g. 1 Samuel 7:6). We also see references to fasting in order to implore God for help when faced with a tragedy or impending danger of some sort (e.g. 2 Samuel 12:16, Esther 4:16). In the New Testament, Jesus himself gives us an example of fasting for forty days and nights before he begins his public ministry (Matthew 4:2). And when his disciples are surprised and frustrated at their failure to cast out a particular demon, Jesus tells them that some demons can only be cast out through prayer and fasting (Mark 9:29). The early church continued the practice of fasting, especially as an act of penance and in observance of certain holy days or times of year in remembrance of the sufferings of Christ. Scripture firmly establishes the importance of fasting. However, it also makes it clear that not all fasting is pleasing to God. In Isaiah 58 and Zechariah 7:5 we see that the Lord was not pleased with the people’s fasting. In the New Testament Jesus warns his followers make a big show of their fasting to attract the attention of others (Matthew 6:16). The key to fasting stands out here: fasting is not only something external, it must be internal as well. It must be an act of the heart, an act of sacrifice and love. This is precisely what God commands in Joel 2:12: “’Yet even now,’ says the Lord, ‘return to me with all your heart, with fasting, with weeping, and with mourning.’” Fasting is about the heart. Its purpose is to orient our hearts away from the world and toward God. It is a way to give our Lord everything, physically and spiritually, our entire intellect and will. In Isaiah 1:11 and following God tells Israel that he has had enough of their vain, external sacrifices. In order for the sacrifices to be acceptable, they need to be made with the proper internal disposition: “Wash yourselves; make yourselves clean; remove the evil of your doings from before my eyes; cease to do evil, learn to do good; seek justice, correct oppression; defend the fatherless, plead for the widow. Come now, let us reason together, says the Lord: though your sins are like scarlet, they shall be as white as snow; though they are red like crimson, they shall become like wool” (Isaiah 1:16–18). The same is true for fasting. In a beloved writing highly respected in the early Church, The Shepherd of Hermas, we learn that a true and genuine fast requires a connection with brotherly love. Keeping the Lord’s commandments is the necessary beginning to being able to keep a fast pleasing to the Lord. In other words, fasting is not merely depriving our bodies of food. It is a way of giving the Lord our very hearts through the act of a physical sacrifice. The Shepherd of Hermas also teaches us that a better fast includes more than just abstaining from food: “and having reckoned up the price of the dishes of that day which you intended to have eaten, you will give it to a widow, or an orphan, or to some person in want, and thus you will exhibit humility of mind, so that he who has received benefit from your humility may fill his own soul, and pray for you to the Lord” (Shepherd of Hermas Book III). So when we fast we not only love God by giving him our hearts in this sacrifice of the flesh, but we love our neighbor by providing for his need and we are blessed by receiving the benefit of the prayers of our neighbor in return. Everyone wins. In his Introduction to the Devout Life, St. Francis de Sales describes even more benefits of fasting: “besides the usual effects of fasting, viz., to elevate the spirit, to keep the flesh in subjection, to exercise virtue, and to acquire a greater reward in heaven, it is a great means to restrain gluttony, and keep the sensual appetites and the body subject to the law of the spirit: and although we may not fast much, yet the enemy fears us when he knows we know how to fast.” The enemy fears us when we fast… some demons can only be cast out through prayer and fasting. This is truly a reward from the Father, and why we must always follow the words of our Lord and fast without calling undue attention to ourselves. It is not merely an exterior work as some would say—and as I used to think. It is a work of transforming our very soul, getting out of ourselves, and bringing us both to humility and greatness in the love of God. After 19 years as a police sergeant, Derek Barr left the public service of local government and entered the public service of the Catholic Church to teach about the Sacred Scriptures. Derek is a former Denver Catholic Biblical School student and a graduate of the Augustine Institute where he received an MA in Biblical Theology. Derek is a convert to the faith and was formally received into the Catholic Church on Easter Vigil 2006. Derek has been teaching for the Lay Division of St. John Vianney Seminary since 2010. Derek is the proud father of four daughters, a son, and a son-in-law, and loves to spend his free time with them.